Palouzes, in Cypriot dialect or Moustalevria in Greek, is a pudding made with either fresh grape juice during autumn or with concentrated grape juice (petimezi or epsima, in Cypriot) when no fresh juice is available. Must (in Greek moustos and in Latin vinum mustum, meaning “young wine”) is freshly pressed grape juice. Moustalevria in Greek, from “moustos” = grape must and “alevri” = flour , or Palouzes in the Cypriot dialect, is a pudding made with these two basic ingredients. It is usually flavoured (optional) with arbaroriza (kiouli, in Cypriot), which are scented geranium leaves, vanilla or mastiha (mastic resin). These ingredients are boiled together until the pudding thickens. I am not sure about the origin of the Cypriot name of this pudding but I’ve seen Middle Eastern recipes with the name “balouza” which is a kind of pudding made with fruit juice or milk and corn flour (starch), so I think it may have some kind of connection. Grape juice, usually from red grapes is used but it can also be made with white grape juice. It is equally delicious but when using white grapes the colour is much lighter. The best time to make palouzes is September to October, when the grapes are sweet and cheap. However as I wanted to share this recipe with you in time, last Tuesday when I went to the farmers’ market, the grapes were at a reasonable price so I bought some sultana grapes to make this dessert. Every recipe you will be reading today has to do with “GRAPE MUST” but the only thing I made myself was palouzes (moustalevria). The other are just an explanation of what they are and how I remember them being made. The traditional way of making palouzes was quite complicated as I remember my mother would make large quantities. Of course, all the family and even friends or neighbours were there to help. They would add a special white soil to the must, yes that’s right soil, which after boiling, helped to remove all the impurities from the must. (See note in comments by Niki: The soil that is added to the grape juice is in fact chalk and as an alkaline, it neutralises the acid giving a sweeter taste to the end product). It was boiled in big caldrons called “chartzia, again in Cypriot dialect”and passed from sieves several times. It was a quite tedious procedure as the pressing of the grapes is not easy. They used to do this using their feet (grape stomping), same way when taking the juice to make wine) and would prepare an outdoor fire to cook it. When the first step of boiling finished, after it cooled down they would remove it from the caldron in other pots and whatever residue rested in the bottom, they would pour away. After that they would put it back in the caldron, add the flour and stir it with a large wooden stick until it would set. That procedure was very difficult as well. The pudding was flavoured with kiouli (arbaroriza in Greek) which is the fragrant geranium leaves, or if they didn’t have any, with vanilla or mastic gum (resin). They would then put the pudding in bowls and some in large baking tins. In the bowls they would sprinkle some cinnamon and crashed almonds or walnuts on top. The pudding would be eaten either warm or cold. With the remaining they would either make shoushoukos or kiofterka. The moustalevria I make is a much more simplified way of making this pudding. Thiw recipe was given to me by my elder sister Zoe. The recipe that follows is made with a mixture of both moustos (grape must) which I bought at the farmers’ market and petimezi – epsima (concentrated grape syrup) so the preparation is much easier. I must warn you that if you decide to make this dessert from scratch, when you finish you’ll end up with a very messy kitchen but it is worth while to make it at least once. If you have a juicer the procedure is much easier or if not, use a food processor and a strainer to strain the juice. However, in Greece you can buy “grape must” at the farmers’ market or at wineries during September – October. Usually, this ready made grape must is boiled and cleaned from impurities, so the only thing you need to do is to add the flour and mix until it sets. “Epsima”, or petimezi as it is called in Greek is made from black grapes and is known for thousands of years. Athinaios, the ancient Greek nutritionist and writer wrote about a fish recipe where a hint of epsima was used and he states that creations like those were why people did not become cannibals. When boiling the grape must for a long time (no sugar is added) it concentrates into a sweet syrup. It’s Cypriot name “epsima” comes from the ancient Greek word afepsima (αφέψημα) which means to brew. In the old days they did not have sugar, so apart from using honey, during summer, when sweet fruits were abundant they made natural sweeteners from sweet fruit such as grapes, figs, pomegranate or carobs. The flavour of these syrups is amazing but most of all they are way much healthier than any other sweeteners, as they contain antioxidants, vitamins and minerals. It is rich in energy, iron and calcium. It does not contain preservatives, artificial colourings or sugar. It is preserved for a long period without having to refrigerate it. Served in small “morning shots” for immediate energy empowerment: excellent source of iron (anemia), for sore throat treatment, as an antidepressant. For marinades in cooking, especially with vinegar, in sweet and sour sauces and salads using balsamic vinegar. In confectionery as a sweetener, in beverages, with Greek yoghurt, or to make cookies called moustokouloura, pishies, kattimerka, halvas, to top homemade pancakes or xerotigana, on which they added epsima instead of honey. A very simple dessert my mother used to make was souppouthkia. She fried small cubes of stale bread, and after frying the bread, the remaining oil would be discarded and epsima was added to make this simple dessert. My mother would also make “koulourouthkia me to epsima”, which is made of dough which she shaped into small spiral rings. The same “koulourouthkia” were also made with teratsomelo (charoupomelo, in Greek), which is carob syrup. These were cooked like pasta, then most of the water was discarded and epsima was added. They were cooked for a few more minutes to absorb the syrup. Palouzes (moustalevria) was made during the autumn with fresh grape juice. During winter, they would use epsima to make grouta, which is similar to moustalevria. The concentrated grape syrup was then diluted in water and made a pudding which they thickened with flour. The other product made of palouzes was shoushoukos or soutzioukos. 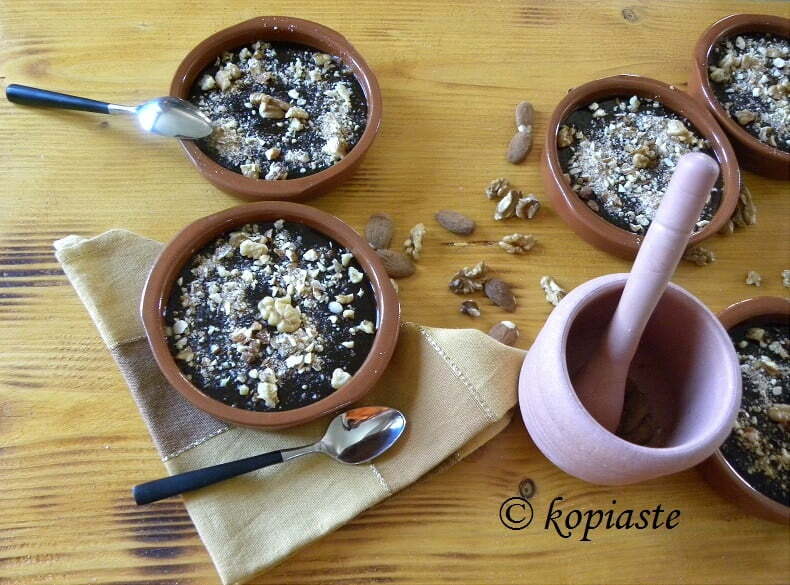 Shoushoukos is a candy made with grape pudding and almonds and some times with walnuts. To make it, they would thread almonds with a needle and when the palouzes was ready, they would hang these threaded almonds on a stick, shaped with an upside down V, which they cut from trees (now they hang them on metallic ones) and dip them in the mixture about four times, until the almonds were covered with the grape pudding. They would hang the threads and some of the mixture would drip off. The following day they would make a new palouzes and would dip the threads again. They repeat this procedure the following day until the almonds are totally covered and the candle or sausage shaped product becomes about 1 inch thick. In order to store this candy for the winter months, they hang the threads in the shade and these will dehydrate. This way they can be preserved for the winter ahead! Last October when I went to Cyprus I brought a lot with me and still have some in the refrigerator. Some of it I wrapped in cling film and placed it in the deep freezer and when I defrosted it, it was as fresh as when I brought it with me. Recent variations are made with pistachio, pomegranate or carob. As I said above, they would make large quantities as apart from eating palouzes, they would make shoushoukos out of the same mixture and what was left, they would make kiofterka. To make kiofterka, after making palouzes and shoushoukos, they put the leftover pudding in big baking tins and leave it a couple of days. They then cut it into rhombus (diamond shaped) or rectangular pieces about 3 X 2 inches long but not very thick, about ½ inch thick and leave them in a “tsestos” to dry for many days in a shady place, to dehydrate. They become hard but chewy but still delicious and they eat these as well as a snack during winter. Tsestos was a traditional handmade shallow basket made either from palm leaves, rope from stubble or straw. These were a must in the traditional Cypriot household, in many colourful designs and sizes. They were used to carry objects such as koulouria, when they invited people to weddings, to dry trahanas, to cut fides (angels’ hair) or other pasta, to place the bread or flaounes to rise, during Easter, to dry kiofterka etc. Palouzes, in Cypriot dialect or Moustalevria, is a pudding made with either fresh grape juice during autumn or with concentrated grape juice (petimezi or epsima, in Cypriot) when no fresh juice is available. Boil the grape must together with the fragrant geranium leaves for five minutes. Dilute the flour and corn flour with the water and mix in the concentrated grape juice. Discard the fragrant geranium leaves and add this mixture to the grape juice. Mix continuously with a balloon whisk until it sets. Pound the almonds and walnuts and mix in the cinnamon and sugar. Wet a bowl with the citrus blossom water. Empty it in another bowl and continue until all are wet. Empty any leftover in the pudding and mix. Divide the pudding in the bowls and sprinkle with the almonds and walnuts on top. I am submitting this recipe to Weekend Herb Blogging hosted by Srivali, of Cooking 4 all Seasons and created by Kalyn, of Kalyn’s Kitchen. Now this is a dessert that is totally new to me. It sounds wonderful. Im glad you cna educate us on these things, because otherwise I would never know. Great new site. This looks really good. I always find something interesting when I come to your blog. Speaking of blog, I love the new website! Sure looks gorgeous! I wouldn’t mind a messy kitchen if I could enjoy pazoules at the end of the day 🙂 Also, it was interesting to find out about the addition of soil. Courtney, this is why I love blogging. We all learn so many different things every day. Bobby, it’s good to see you here as well and thanks. Lore, it is oxymoron to add soil to clean the impurities, isn’t it, but it was something tried and tested and it did work. Of course not any soil could be used, just a white soil which did not become mud. It was just like using fat to make soap. Another weird thing used was ash water. They would add ashes (but only clean wood ashes, not from bbq) into water and preferably rain water, which would release the lye (something like soda) contained in the ashes which they then filtered many times and used this water to make cookies and other things. Ash water was very popular in washing (hair, clothes, cooking utensils) as it would remove grease and especially for clothes which made them extra white. A few weeks ago I saw a new laundry detergent in which they use ashes, so it seems that we are returning back to nature after all the pollution caused to the environment. I’ve had the Greek version a few times and it sounds very similar to this. There’s something special about “moustalevria” and I really had no idea how much work there was involved in creating it! thanks for the lesson on all the other by products too Ivy…always learn a few things coming to your blog. Peter I am glad you’ve had moustalevria. If it was with fresh grape juice it’s the same but if it’s with petimezi it’s called grouta and tastes a bit different. Ivy, I have really learnt so much today through your lovely post! thanks for sharing it with us! Thank you Shrivali very much. It was my pleasure. Ivy, what a great post! I love learning about Greek culture from your site. making this dish is no mean feat, having to handle 3kg of grapes for juice, but the end result looks lovely. Cake (lol) Thank God we have juicers because traditionally they used to press the grapes with their feet. This is really interesting. I’ve always avoided grape must recipes because it’s hard to find around here, but if I can make it myself it becomes a very feasible option. I’ll definitely give this a test run for the medieval lunch, and if I can keep the cost low enough it will definitely make an appearance. Thanks! I thought you might like this and it is light and delicious. If you need any clarifications please let me know. Hey sis, these are traditions which the younger generation do not know about, so I thought at least I should write what I remember. Jenn, (lol) I wouldn’t do this more than a couple of times a year. Hey Ivy…loved the background info. Could see cauldrons of grapes boiling away like in Asterix & Obelix comics I read as a child!! LOL…I love the way it has just 2 ingredients. BTW, spoonfuls ate tbsps or tsps? My Dad has a grapevine…maybe one day…just a thought!! Hi Deeba (lol) exactly those caldrons were just like in Asterix. Since you have grapevines and you must have a lot of grapes, it would be great if you tried it. I must remember to clarify this somewhere, as in all my recipes when I mention spoonfuls I mean the big spoon. When I use a small spoon I write teaspoon. You’re getting back to your roots…and I like it. You’re the most fabulous Greek food blogger out there. Thanks Emiline, so sweet of you to say so. What a spetacular post! I loved every sentence. and how fabulous to find the scented geranium here. it is so lovely – never thought that it ould be used in food. We know so little about the various culinary possibilities, don’t we?! Hi Valentina, nice to see you here and hope to see you again. Thanks very much for your lovely comments. I am glad you enjoyed it. Hi Ivy… An amazing post, thank you for sharing with us! I remember my grandmother making all of this stuff many years ago. Now that you’ve inspired me, I must give it a go for myself. She also made the little dough rings that you mention except she boiled them carob molasses (teratsomelo). I think she called them koulourouthkia. Hi Nikolas, I am so glad you read the post and I hope you and your family enjoy it, if you make it. Thanks for telling me about koulourouthkia and you are so right. I called my sister this morning and she confirmed it that they are called koulourouthkia me to epsima. I didn’t know that you can make them with teratsomelo (carob syrup) as I have a bottle I brought from Cyprus but didn’t know what to do with it. About koulourouthkia my sister told me that my mum would cook them in water first just like pasta but with no salt and when they were almost done would just leave a little water in and then would add the epsima, so I’m thinking of giving them a try with teratsomelo. Hi Ivy! This is really exotic and new to me, and it’s one dessert for which I can get all the ingredients here – that’s what I like most about it. When you say “Add to the remaining juice and stir until the cream sets”, do you mean we should do this on the stove? Or without fire? wow! so interesting. you’re always highlighting greek and cypriot specialties. it’s a joy to read. Thanks Anna. I enjoyed reading your post as well. Sorry I am so slow at catching up on the WHB entries. I had a very rough week going back to school! This was such a great post, not boring at all! I love learning more about these traditional foods. Salt Lake has a very good Greek Festival each year where you can try some (but not all) of these things. I tried soutzoukos the first time when a friend of mine brought some from Cyprus. I LOVE that stuff. But I just tried to make it following a recipe but I can’t seem to get the mixture to set enough in the pot. It was too watery and didn’t seem to stick to the almonds at all. I can tell you that one glass is more than 1 cup. Hi I am looking for a recipe for Koulourothkia cooked in Teratsomelo. If any of you could help me out that would be great. thank you . Eleni. Eleni, I am e-mailing you the recipe. Hi – i tried making the palouze but it didn't set! Can I do anything with it now or is it for the bin?!! It thickened and it's more like a creamy mousse!! Just back from Cyprus and can answer the question about the soil. The soil that is added to the grape juice is in fact chalk and as an alkaline, it neutralises the acid giving a sweeter taste to the end product. I made palouze last night using the chalk my aunt had given me and it was perfect. Thank you Niki for giving this information. I envy you eating palouze this time of the year. I can’t seem to be able to find the actual recipe (for palouzeh). I’ve tried moustalevria in Greece but I think it was with petimezi. I’ve never made it myself. This sounds quite easy and I am going to try it soon. Thanks a lot for shring thess amazing recipes , waiting for other recipes sooon , I enjoy reading your posts as well. I was last year in november in Troodos mountains in Cyprus. The fresh Shoushoukos I had tasted there are best all of the world…! by boiling 3 hours to sirup before add flour ? What is the exact ratio of juice and flour? ( 1 liter – 100g) ? Do I have to use corn of wheat flour ? How to clean syrup without special white earth…?